This core text provides an excellent concise introduction to infectious diseases. The book integrates basic science with clinical practice with disease-orientated descriptions and clinical presentations on a system-by-system basis. It is therefore ideal for both the student and the practitioner. For this new sixth edition the text has been brought fully up to date throughout. The highly structured and improved text is designed to facilitate easy access to information, making the book an ideal resource for clinical attachments and revision. There is a new chapter that covers infections in special groups, as well as coverage of sepsis and septic shock. The Introductory chapter also takes into account new control measures, emerging infections, and infections linked with bioterrorism. Information on global occurrence is added to the epidemiology sections where relevant and web site information has been included to provide up-to-date resources on fast moving topics such as AIDS, and travel-related infections such as SARS. The result is a text that is a compact yet comprehensive guide to infectious diseases. It will appeal to medical students, junior doctors, general practitioners, and allied health professionals who want a concise introduction to the subject or an ideal revision companion. 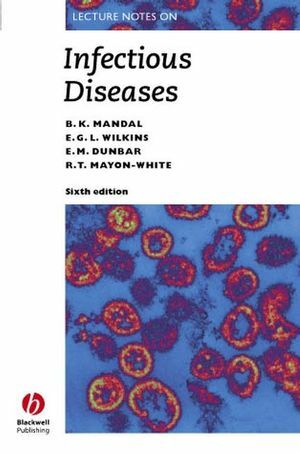 B. K. Mandal and E. G. L. Wilkins are the authors of Lecture Notes: Infectious Diseases, 6th Edition, published by Wiley. - 2. Host Response to Infection. - 4. Eye and Upper Respiratory Tract Infections. - 5. Lower Respiratory Tract Infections. - 6. Infections of the Cardiovascular System. - 7. Infections of the Nervous System. - 8. Rashes, Skin and Soft Tissue Infections. - 9 Infections of the Gastrointestinal Tract. - 10 Infections of the Liver and Biliary Tract. - 11 Infections of the Genitourinary Tract. - 12 Bone and Joint Infections. - 13 Acquired Immunodeficiency Syndrome. Section IV: Infection in Special Groups, Zoonoses, Tropical Diseases, and Helminths. - 16 Infection in Special Groups. - 17 Tropical Infections and Non-helminthic Zoonoses. "A handy guide, which will be used by medical students, physicians, other health-care providers who encounter infectious diseases, and public health students and professionals." "For each infection a vast amount of information is provided in a clear and easily accessible format...This book is excellent." "An excellent revision text to bring together the whole subject in a concise fashion." "This is an excellent core text for students and a rapid reference guide for health professionals dealing with infection." "This book is great for anyone with an interest in infectious diseases and if you're looking for a book with none of the unnecessary waffle and just want bare facts this book is a must."